As a balloon flights operator we’re constantly updating our ballooning fleet and checking equipment both ‘in house’ and ‘out of house’. At the start of September we had all our balloons checked by a Civil Aviation Authority (CAA) inspector who tested our hot air balloons fabric, baskets and gas tanks. All of which met the safety standards set out by the CAA as EASA (European Aviation Safety Agency). To see images of our hot air balloons please check the ‘Our Fleet’ page. 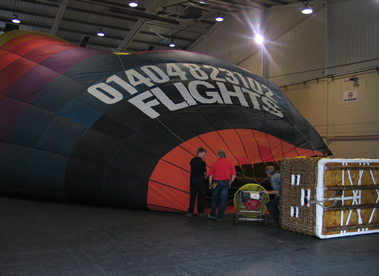 Alternatively you can read more on how we keep ballooning safe in the west country. UPDATE: Thanks to Westpoint Arena and all the staff who allowed us to use their facilities at such late notice. We hope they enjoy their champagne balloon ride over Devon!